Based on a large number of complaints on Reddit and Twitter (via Android Police) it appears that Samsung is having problems properly keeping track of the phones being sent in as trades toward the purchase of a Samsung Galaxy S10. Several consumers who sent in handsets that meet Sammy's requirements for a valid trade are being told that the phone they sent in does not qualify. To qualify for a deal, a phone sent to Samsung must turn on, hold a charge and not power off unexpectedly. The screen must function perfectly without any dead spots, and the phone must exhibit the normal signs of wear and tear only. A factory reset must be performed before Samsung receives the device, amd the phone cannot be blacklisted. Samsung told some would-be Galaxy S10 buyers that they had sent in a phone that was different than the one they originally agreed to trade, even if that wasn't the case. One customer named Cliff took pictures showing that he was sending his Galaxy Note 9 to the company toward the purchase of a Galaxy S10 model. However, Samsung rejected his trade because it claimed that the phone he sent was a Galaxy S7. As a result, the company is charging him the $550 it took off the price of his new phone because of the trade. Others sent in phones for a trade-in that Samsung never credited to their account. 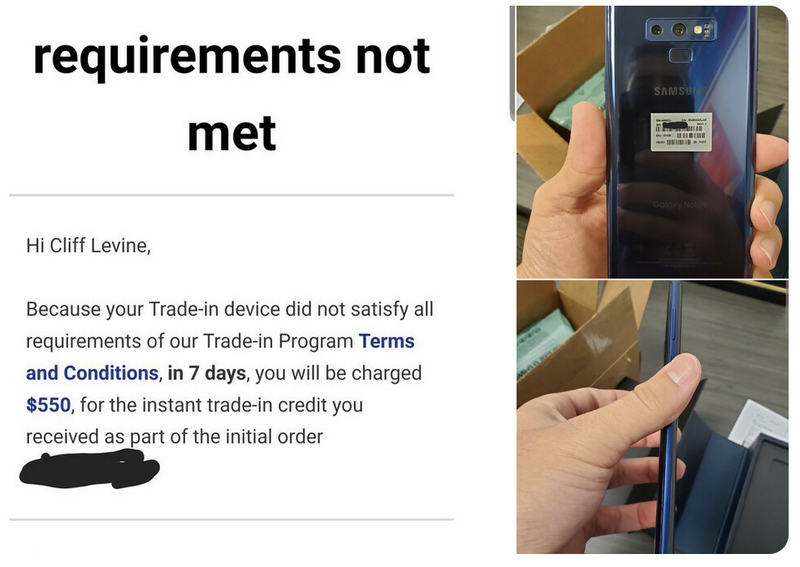 Some mailed units in pristine condition only to be told that their phone was rejected because it didn't meet Samsung's requirements. Perhaps the strangest story was written by someone who sent in a Galaxy Note 9 to receive a $550 credit toward the purchase of a Galaxy S10. His trade was rejected because Samsung claimed that the device they received was a keyboard. Pictures that the company had obviously did not match photos taken by the consumer at the time he mailed in his phone. An investigation has been started. In several cases, Samsung contradicts itself by claiming that a phone doesn't boot on correctly, or that it hasn't been factory reset while stating in the same sentence that it doesn't turn on. Under the company's previous policy, those sending in a trade that didn't meet the eligibility rules would be given $50 in a virtual Visa account, and would not get their phone back. Now, the company is giving customers the option to reject its decision and get their trade-in returned. But those who were told that they never sent in a phone, or mailed in a keyboard, or shipped the wrong phone, what will they get back from Samsung? 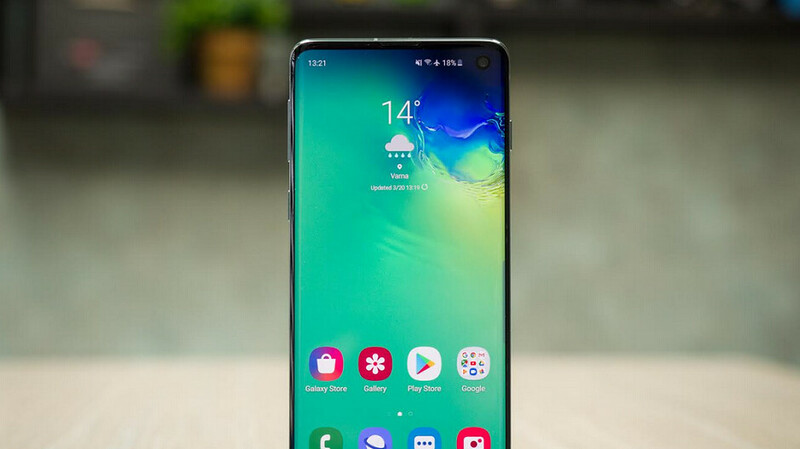 The trade-in deal that Samsung was running offered up to $550 in credit toward the purchase of a Samsung Galaxy S10. The models that were eligible for the maximum credit included the Samsung Galaxy Note 8, Galaxy Note 9, Galaxy S9, Galaxy S9+, the Apple iPhone X, iPhone XS, iPhone XS Max, iPhone XR, the LG V40, and the Google Pixel 3 and Pixel 3 XL. There were other tiers of phones that brought credits ranging from $300 down to $50. Samsung applied the credit at checkout and requested that the trade be shipped to them within one week. If you are caught up in this issue, prepare for a long drawn out battle. A person who bought the Samsung Galaxy Note 9 last October took advantage of a deal that the manufacturer was running. He sent in his prisitine Galaxy S9+ and was expecting to receive $600 in credit as advertised. Luckily, he took photos while packing up his trade. Samsung credited him $50, claiming that the device was not in good enough condition to receive the full $600. After several months of back and forth, and getting the Better Business Bureau (BBB) and an arbitrator involved, the customer finally got the remaning $550 back. But it took him five months to do so. So here's the deal folks. If you plan on shipping in a trade-in to any company, not just Samsung, make sure that you document everything you do by taking photographs or videos. It might be a pain to do this, but it could save you if your trade-in gets mishandled. This seems to happen with every OEM during trade in season. I had issues like crazy with Google when I traded in a Pixel 1 for a Pixel 2. Took almost 2 1/2 months to get my credit. Same here I had no problem sending in my mint condition Verizon Pixel 3XL . Of course there are problems here in there and Samsung isn't the best at handling them. But I also have to wonder if all the stories mentioned are true . My trade ins are usually fine, but I've heard aplenty during the time when they run all the extra trade in promos that it happens here and there. It was smooth sailing for me and my trade-in. I wasn't worried. On another forum community I'm in, everyone there has had success so it's interesting to read this. I hope it will work out for these people though. No issues with my trade-in. Got email from Samsung confirming that they accepted my old phone. Today must be a slow news day. "If you're sending in a trade, document everything you do by taking pictures and filming video" Or just put your existing device on eBay, most of the time you will get more money than on a trade. People are typically scum so I would assume that if a trade in gets rejected, there is probably good reason for it. Yeah, I just wonder if the ones telling this are telling the truth or is there more to the story. But if this is happening a lot Samsung needs to get their s**t together. This is where Apple has the edge, with stores in every state so you don't have to deal with this shipping nonsense, and take them at their word. Samsung needs to fix this ASAP, plain bad business. Set up a trade in program, and then not properly follow your own protocol...c'mon Samsung. You're not ROFLYAO. You typed that with a straight face, and yes Samsung need to get this fixed. i had this happen to me and am going through this as we speak first they charged me 350.00 for the trade in said it didnt qualify because it was locked and sent me a pic of my phone turned on... then i went through a whole thing with them back and forth for 7 days and finally just told them to send me back my s9.... then they went ahead and charged me 550.00 i disputed the 550.00 charge on my credit card AND IF.. they don't return the 350.00 to my card after they get the s10 back i will dispute that too... WILL NEVER BUY ANOTHER SAMSUNG PRODUCT AGAIN! The problem could be from the workers who steals the trade ins and sells it outside rTher than the company. Shouldn't you note the IMEI before returning it, and if it doesn't get accepted, report the phone as stolen so it is blocked. That might even identify who is fiddling the system. I you feel the need to document everything before sending in your phone, maybe you are dealing with the wrong brand. Just another reason I don't send a phone in for trade in. Employee theft must be at an all time high, and they should investigate. Never mind I paid $1000 for my $250-$500 trade in that looks perfect. I'd rather have a spare phone, if not for the fact that Samsung phones as of late are known for not charging if they hit 0% charge (this is very common and I experienced it on 3 Note 8's). I won't stop buying their products as they work great for me outside of some caveats.